Terra McKinney (left) listens to another attendee at the event. Photo by Jabril Faraj. 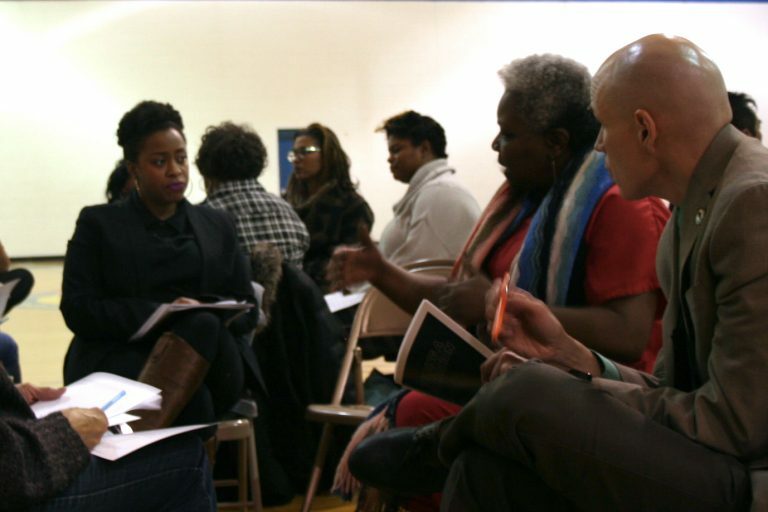 The Milwaukee County Office on African American Affairs recently held a listening session to solicit feedback from residents on a legislative agenda that it hopes will create significant, tangible change for the area’s black community. The agenda, which is focused on garnering bipartisan support, includes measures that would increase funding for workforce development programs, reform the criminal justice system and increase access to employment and work incentives. The Office on African American Affairs (OAAA), which was created in November 2015 by then-county supervisor Khalif Rainey, has been mired by questions of funding, staffing and what the office would seek to achieve. Rainey, who is now District 7 alderman, criticized what he said was a lack of action by the office in the 15 months since its creation. “In that time, we’ve seen no improvement in the joblessness … the education, and we’ve seen unrest,” he said, referring to the sometimes-violent demonstrations that swept through Sherman Park last August. County Executive Chris Abele addresses the crowd during the event. Photo by Jabril Faraj. According to the 2017 adopted county budget, $267,170 has been budgeted for OAAA, after the office received no funding in 2015 and 2016. A director has yet to be hired and three of four positions within the office are still vacant. Another $300,000 has been set aside and will be approved by the county board once a director is in place— which Holton said he hopes will happen by spring —and a plan to spend the funds has been approved. “Once we’re staffed up, that’s going to allow us to take the next step forward,” Holton said. 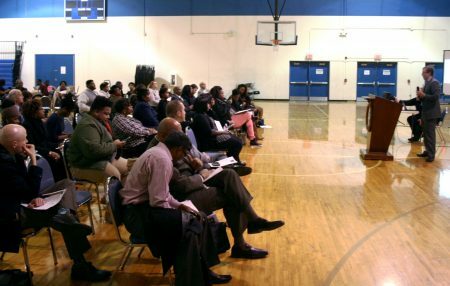 OAAA has outlined a strategy that utilizes community input to define issues central to Milwaukee’s black community and to influence policy and develop programs “related to the special needs of African Americans,” according to its website. The office is working on an analysis of African-American-owned businesses in the city and has held previous listening sessions focused on segregation and workforce development. It plans to continue the practice, said Abele. The fourth and most recent session focused on how items such as increasing the Earned Income Tax Credit, doubling funding for apprenticeships, expanding expungement access and “Ban the Box” legislation would affect participants or people they know. Shanyeill McCloud, founder of Clean Slate Milwaukee, an organization that works with individuals to expunge their records, said a prior conviction can affect a person’s ability to get a job, find housing and pursue educational opportunities. In Milwaukee County more than half of African American men in their 30s have served time in state prison. To expunge a non-violent felony, state law requires the individual to have been younger than 25 at the time of the offense, no matter how long it has been since the offense, a policy that lags behind nearby states. McCloud hopes to see a 2009 law that allowed for felony expungement made retroactive. “What are we gaining by holding those people back?” McCloud asked. To that end, OAAA is working with a local black-owned company to scrape data from the Wisconsin Circuit Court Access Portal (CCAP) to be able to better show how prior convictions are affecting the community as a whole. Republicans hold majorities in both houses of the state legislature, and almost a two-thirds majority in the assembly, which has caused OAAA to focus its agenda on measures it expects will garner support from Democrats and Republicans. McCloud said she has had a handful of one-on-one conversations with Republican legislators regarding the expungement bill and, so far, has received a positive response. Still, some attendees said there are deeper issues that need to be addressed. Terra McKinney, who has lived in Milwaukee since 1996, pointed to a “racial divide” that often doesn’t allow for good-faith dialogue. “You know, you can read the word ‘collaboration’ on a piece of paper but, unless [there are] two sets of rational people there to actually want to get to some sort of a solution, it doesn’t really make sense,” McKinney said. In August 2016, Todd Elliott Koger submitted “a plan to target the black vote and foundation of the Democratic Party’s “voter’s turnout model” to change the destructive conversation that the “verbal fight” Mr. Trump was having with Khizr Khan, a slain U.S. soldier’s father had caused. President Trump’s verbatim use of Mr. Koger’s words in “online video” and speeches that followed in Michigan, Milwaukee (Wisconsin) and Pennsylvania changed the course of his campaign and put it on track for victory. In conclusion, Todd Elliott Koger’s “Treaty with Black America” in its original draft is a proposal to help black boys and girls better understand their “capability to do things.” Rebuilding their own neighborhoods and the houses they “should own and live in” will help them understand their worth and value. How black youth believe they are viewed (as clients, participants, or “the agents of change”) determines the success of their efforts. Creating a “commonality interest” and ensuring a “living wage” to sustain their families, is proposed “TO LOWER THE BODY COUNT” (PASTOR DARRELL SCOTT)!!! Also be advised, in his Twitter profile Scott referred to himself as Dr. Darrell Scott. President Donald Trump has also referred to Scott as “Dr. Darrell Scott.” In his church bio Scott’s says: “Already a 21st Century Theologian and Scholar in his own right, Dr. Darrell went on to receive his Doctorate of Divinity in November of 2004.” That is, his bio is worded in a way that creates the impression that he earned the degree. To use the title “Dr.” is inappropriate and misleading since the degree was not earned. Compounding the problem is the questionable status of the college. St. Thomas Christian University is not accredited by any Department of Education or Council for Higher Education Accreditation recognized accrediting body. St. Thomas is currently unlicensed in the state of Florida. Mr. Scott appears to be using his degree from an unaccredited school to create an impression that he earned a doctorate.